Here is the second half of my Piggy Polish swatches. 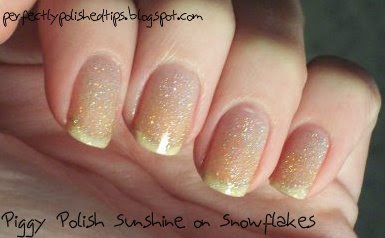 Sunshine on Snowflakes is holographic glitter in a clear base. I probably should have layered this over another color. My nails are so yellow and not in any shape to be photographed naked. This polish reminds me a lot of China Glaze Fairy Dust but I think the glitter pieces are larger. Purple HEYS is a fuchsia creme and a bit more purple in real life. It applied wonderfully and dries shiny. It's similar to Zoya Audrina but slightly less pastel. Pirates & Giggles is a sheer pink with pink shimmer. The above picture is three coats of polish. I would prefer to layer it over another polish but that's just me. Pirates & Giggles with flash. Pinkerbelle is a bubble gum pink creme. It has no hints of coral like the picture might suggest. It wasn't chalky at all though which is always good. Like I mentioned in my last Piggy Polish post their polishes seem to look better with three coats, all of these swatches are three coats except for Sunshine on Snowflakes which is only two.